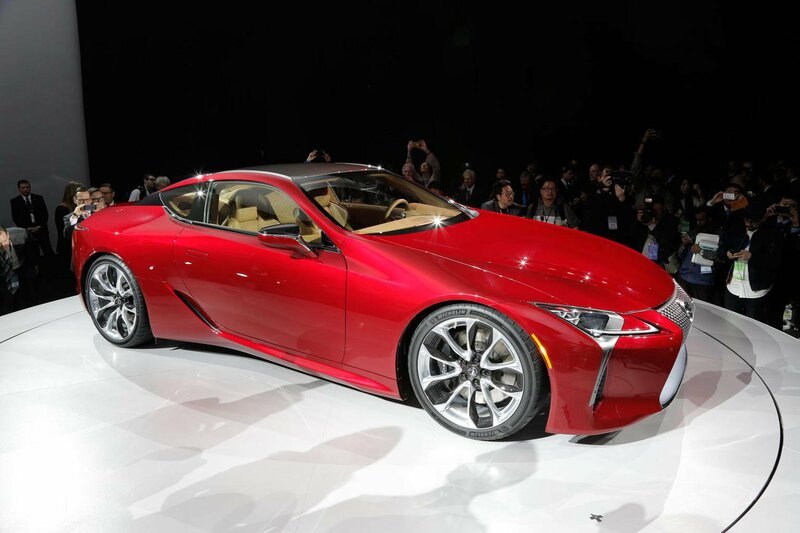 Lexus LC 500 coup unveiled at Detroit motor show | What Car? Lexus has revealed its new LC 500 coupé at the Detroit motor show. The new model is the production version of the LF-LC concept car, which made its debut at the same show in 2012. The production model keeps many of the same design cues as the concept, keeping that car's swept-back roofline and angular headlights. Inside, it features a digital instrument cluster and Lexus's next-generation infotainment system. Powering the LC 500 coupé is the same naturally aspirated 5.0-litre V8 that features in the RC F and GS F models. Here, it produces 467bhp an 389lb ft of torque and sends its power to the rear wheels through a 10-speed automatic transmission. Lexus says the new model can reach 60mph from a standing start in less than four and a half seconds. Despite using a large V8 engine, Lexus has given the car a sound generator to 'enhance' its tone in the cabin. The exhaust also features valves which can alter the volume and tone of noise to suit different driving situations. Lexus says the new model has been designed to blend the characteristics of a performance car with a comfortable ride, suggesting the LC 500 is designed to be more of a grand tourer than an out-and-out track car. Any launch date and pricing information is yet to be officially confirmed, but we expect order books for the LC 500 coupé to open later this year.